Bolinfest Changeblog: Give a man a fish or teach a man to fish? Therefore, even if you have adamantly committed yourself to jQuery, I think you will learn a lot from this book. As some members of the jQuery community have already begun to concede, jQuery is not the right solution for large software projects. Perhaps jQuery will reach a point where it is redesigned for writing more complex applications, and if it does, I certainly hope it looks to Closure for guidance. If one wants to build something that rivals Gmail or Google Maps in frontend sophistication and performance, then why not look to the toolkit that made those products possible and learn from the design decisions that shaped it? An alternative interpretation of Closure: The Definitive Guide is that it is just a braindump of everything I learned about web development while at Google. As I chose to spend four years at Google rather than in a PhD program, I often think of the book as my dissertation (though unlike a doctoral thesis, someone will actually read it -- zing!). However, the analogy does not quite fit, as I cannot claim Closure to be a product of my own research. At Google, I was far more often a consumer of Closure than a producer. Yet in the course of writing the book, the balance has shifted, and I have found more time to submit patches, file bug reports, and build tools on top of Closure such as plovr. I think that it was only until I had really gotten into writing the book that I could fully appreciate the entire toolkit and confidently contribute back to all areas of it, knowing that my contributions would be consistent with its underlying principles. Which brings me to the title of this blog post: Give a man a fish or teach a man to fish? In a world filled with O’Reilly cookbooks and Stack Overflow articles, I often see developers focused on consuming the information that helps them fix the issue that they are currently debugging and then moving on to the next problem. The drawback of this approach is that when that developer encounters a problem that no one has blogged about, he is stuck. Because the Web has always given him fish, he has no idea how to fish when Google cannot find the answer. For this reason, Closure: The Definitive Guide aims to be a “teach a man to fish” type of book. When I think about my favorite technical books, such as Effective Java by Joshua Bloch, they are the ones that discuss principles as well as practice. When you have the correct mental model for a tool or programming language, it is possible to exploit that knowledge to solve new problems. By comparison, if you limit yourself to solutions that are pasted on message boards, then by definition, you will never be solving problems that have not been solved before (how boring!). 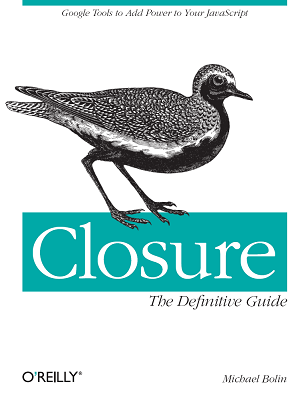 Rest assured that at 550 pages, Closure: The Definitive Guide contains plenty of code samples and other practical information, but it also does its best to explain the problems that Closure is designed to solve and why the tools work the way they do. The book also touches upon other areas related to web development. As mentioned earlier, I care a lot about software engineering, so I include a surprisingly large discussion of Ant, as I believe it is incredibly important to have scripts for automating common tasks (it is not important that they be written in Ant, just that they exist). I even went so far as to create plovr (which is introduced in Appendix C) because I did not feel that the edit-reload-test cycle that one gets out of the box with Closure was fast enough. The book also contains other such “digressions,” such as the section on goog.partial() that goes into considerable detail about function currying and the scope of a closure. In other parts of the book, you will find short asides on security vulnerabilities such as XSS and XSRF (which gave me an excuse to include Exploits of a Mom on page 76! ).